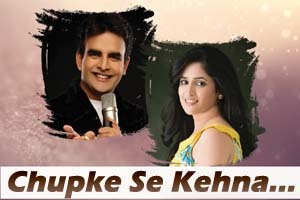 Hindi Lyrics 4 U: Lyrics Of "Chupke Se Kehna" From Latest Album - Chupke Se Kehna (2016). Lyrics Of "Chupke Se Kehna" From Latest Album - Chupke Se Kehna (2016). Beautiful romantic song sung by Dhawall Chandwadkkar, Avantika Pande and music composed by Khalil Abhyankar. The audio of this song is available on YouTube at the official channel Universal Music India. This audio is of 3 minutes 44 seconds duration. Lyrics of "Chupke Se Kehna"
Lyrics in Hindi (Unicode) of "चुपके से कहना"